she has pleaded the police to put an end to this affair, a police officer of Hettipola Police said. The complainant is a resident of Hatton while the young girl is a resident of Hettipola, police say. This young mother has asked Hettipola Officer in Charge of Hettipola Police, Inspector of Police, Mr. Ananda Rajapaksha to mete out justice to her too in this instance. Police say that since it is not possible to get down the petitioner's husband at that moment as he is employed in Colombo, the campus student who lives in Hettipola police region was summoned for the inquiry. 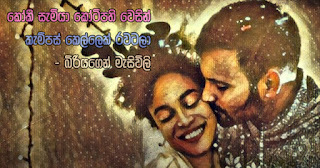 The university student has told police officer in charge, Mr. Ananda Rajapaksa that she has come to know him from the facebook and that she was not aware that he was a married person. The campus student has further told police that he had told her that he was a millionaire who owns several hotels. The student has also told police that he had come to meet her on a number of instances and on all such occasions he was impeccably dressed. The girl has admitted that he had on a number of instances he had given money to her and that she did not know that he was a cook at a private hotel and has promised in the presence of officer in charge Mr. Rajapaksa that she would promptly end the alliance. The police officer in charge says that this incident is a fine lesson for young people who develop romances through facebook without knowing proper information about each other.